At the Utility Leaders Forum at the IWA World Water Congress in Lisbon utility leaders were asked to explore the Watershare® model and decide on how they want to share knowledge and experience facing the challenges in the water sector until 2030. 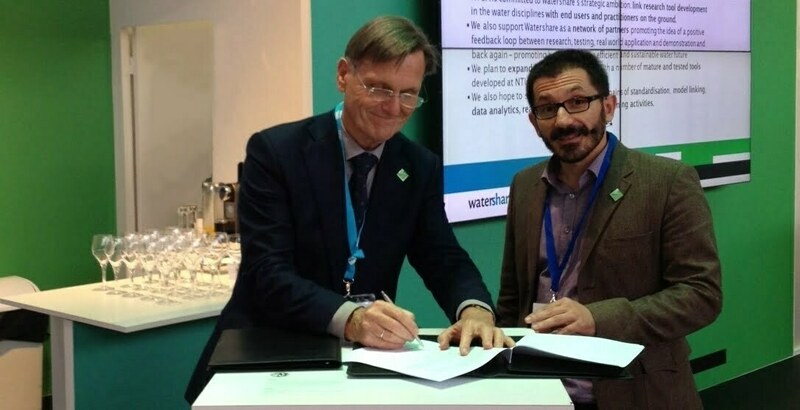 Watershare® is a global network of highly reputed water institutes that collaborate intensively in order to better serve their end-user clients. Within Watershare®, selected knowledge institutes from all over the world share their expert water-related R&D tools. The National Technical University of Athens (NTUA), Greece’s leading technology and engineering university, became a strategic, platinum partner of the rapidly expanding Watershare® initiative. “This is a milestone for our water research and development strategy”, said Christos Makropoulos, who presented NTUA’s work and potential role within Watershare® at the IWA World Water Congress. “We have been doing excellent research over the years, but have always struggled with getting our tools known and adopted by the water industry – both in Greece and abroad. We think Watershare® that is the way forward for us in this respect.” Greece has been looking for improved links between research and development and market uptake as a way to boost the economy and create new markets for its high level research products, services and people. Watershare® is now considered by NTUA as an important partnership and knowledge management strategy towards more outward looking entrepreneurial activities, complementing other scientific and professional networks associations and partnerships in which the university is already a member.